It looks like Putin's state-run media have essentially done a perfect job at swaying the Russian public over to his side of the story about the Ukraine crisis and MH17. These three Gallup polls in particular are fairly depressing. The first survey shows that the Ukrainian Civil War has, in effect, been an incredible boon to Putin's domestic image. After years of truly enviable approval for a public figure, Putin's popularity was beginning to wane with Russians in 2013, reaching a nadir at about 53% (which is still quite a bit better than most American presidents can expect well into their second term, let alone their third term). However, following Russia's invasion and annexation of Crimea and the President's increasingly combative attitude toward the West, Putin's has soared back up to an astounding 83%. Why this may be is pretty heavily inferred by the second poll, which charts where Russians get their news from and what sources they believe credible. Over 75% of all Russians stated their trust in state-owned media, which overwhelmingly news coverage in the Motherland, particularly following a decade-long attack on independent news sources by the Kremlin. All other news sources pale in comparison: private Russian news is given only a 30% rating, while only 5% of all Russians consider Western media from Europe or the United States at all trustworthy. Which leads us to the third finding from Gallup, published today. When asked how Russia should treat Ukraine, 63% of the public said Russia should take a very strong position towards the former Soviet republic. Less than half as many said Russia should prioritize good relations with the country. Based on this, I think it's fair to say it's very unlikely Putin's going to experience any domestic pressure to change policy, at least for the near future. These results are, I think, eye-opening. Living in democratic republics with a fairly pluralistic mindset and several avenues of news to choose from, I think it's easy to forget that's not the only manner of society people may experience. Our coverage of the news here in America is far from perfect and there's plenty of evidence to suggest we can be led around the nose by misleading news as well. But Europe and the United States are both societies where, in more cases than not, rule of law prevails and there's a strong aversion to state-mandated censorship, at least in any kind of overt way. This is not the case in Russia, where independent journalists are often arrested or even killed, where nearly every major news station outside of government control has been shut down or placed under heavy restrictions, and where protesters and human rights activists are routinelydismissed as foreign agitators. The end result of which is that despite the fact that Putin flaunts international law and has been called out numerous times for humanitarian offenses within his own country by organizations like Amnesty International, he gets what is essentially a free pass from Russians. There is no opposition in Russia to speak of, at least none that can put up any kind of real legislative fight. There is no culture war. There is no fight for the soul of Russia. 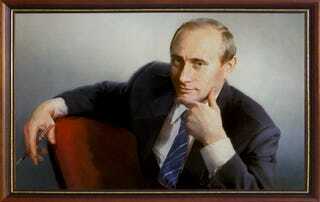 Putin's won and all that remains is United Russia.